HARRY HOUDINI & BEATRICE HOUDINI INSCRIBED BOOK. This is a great piece of history! 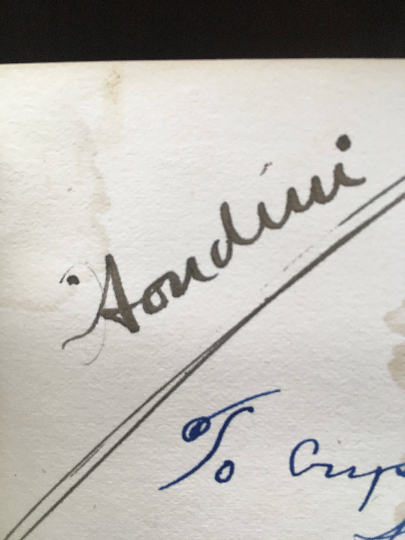 From the library of magician Harry Houdini with his “Houdini” ownership signature on front free endpaper. Also inscribed on same leaf by Beatrice Houdini to Crystal Lawes, inscription dated June 9, 1927. Crystal Lawes was the daughter of the Warden of Sing Sing Prison and good friend of the Houdinis, Lewis E. Lawes. Houdini left his collection of books on crime and penology to Lawes. Spine ends frayed, some edge wear; dampstain throughout affecting Mrs. Houdini’s inscription but just barely touching Houdini’s signature. The book itself is in good condition only (although looks better from the outside), but Harry Houdini’s signature is quite nice. 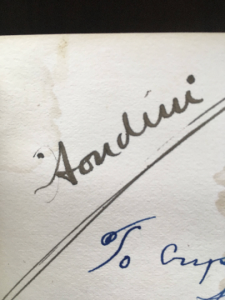 The value of Houdini signatures keeps rising, as more and more of them are going into permanent collections.